The UN envoy Martin Griffith is working hard to achieve his first success in the Yemeni peace portfolio since his appointment in February 2018. The December 2018 consultations and the presence of the internationally recognized government and the Houthi group to Stockholm represent a success after he his first failure when the Houthis refused to attend consultations in Geneva scheduled for early September 2018. Griffith's move is driven by an international desire to stop war in Yemen and to end what the United Nations described as the biggest human-made humanitarian crisis the world has witnessed in the modern era. ]; the Houthis rejected the new federal state of six regions, if the Azal region, where the Houthis live, does not include a sea port. The Houthis imposed a siege on the house of President AbdRabbo Mansour Hadi and placed him under house arrest. They dissolved the Parliament and formed a supreme revolutionary committee to run the country instead of the government and the presidency. President Hadi managed to flee for Aden, and Saudi Arabia later announced to lead an Arab coalition in March 2015 in support of President Hadi and his legitimate authority against the coup led by the Houthis and former President Ali Abdullah Saleh. Griffith, a British national, has depended in his efforts upon his relations with the Yemeni parties since 2017 when he was leading a back-up effort for the sake of the EU as he was president of the EU's Peace Institute. He formed working groups from all parties, researchers, politicians and social figures to form a vision of what is coming up in his actions. But in September 2018, Griffith crushed with the first rock on his way when the Houthis rejected to attend consultations in Geneva. 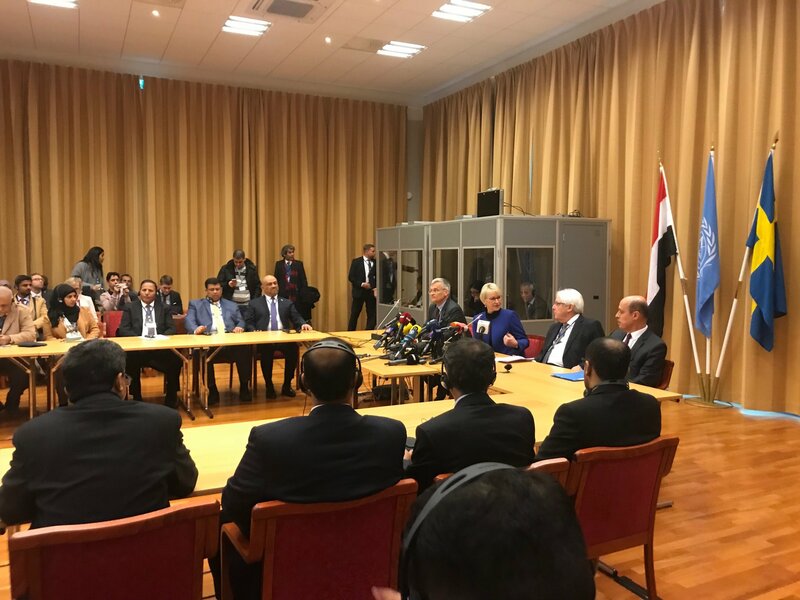 Griffith received support from the international community, including Britain, the United States, Russia and other countries, to initiate intra-Yemeni consultations. Griffith also exploited the international pressure on Saudi after the killing of Saudi journalist Jamal Khashoggi inside the Saudi Counsel in Turkey for pressuring on Saudi Arabia to make progress in his vision for peace in Yemen. After their meetings with Griffith in October 2018, US Secretary of State, Michael Pompeo, and US Defense Secretary, James Matisse, called for an end to the fighting in Yemen and expressed their public support for the UN-proposed peace talks. British Secretary of State for Foreign and Commonwealth Affairs, Jeremy Hunt, also took part in shuttle tours to support Griffith's peace plans in Yemen, including Abu Dhabi, Riyadh and Tehran. Tehran is the main supporter of the armed Houthi group. • Withdrawing heavy weapons including ballistic missiles from Yemen. "No one will invade Yemen," Matisse said. • A self-governing Houthi region in northern Yemen "in order to be empowered and able to quit Iran and to get their voice heard." In the past two years, Trump has not said much about the conflict in Yemen, leaving its Saudi allies to take the lead. But Matisse and Pompeo's statements indicate that the United States is now interfering in a way that has never happened before, despite their constant defense of Saudi Arabia's right to protect its borders and fighting the Houthis and Iran's influence in the region. The increasing pressure from the US Congress on Trump’s administration before and after the US midterm elections, and the Democrats winning of the majority in the US Senate made Trump's administration ease pressure on Saudi, especially about the killing of Saudi journalist Jamal Khashoggi, avoiding any confrontational stance with Saudi Arabia to get a chance to make a progress in the peace file on Yemen. The US decision to stop providing coalition aircrafts with fuel in the air was an attempt to reduce the congestion in the US Congress against the Trump administration, but it may increase the mistakes of the Arab Coalition air raids and the escape of targets that are monitored while returning to refuel, unless the coalition really has its own fleet to supply its aircrafts in the air. However, Washington will not abandon the support for Saudi Arabia and military operations as a huge international power in supporting the Arab Coalition. This appeared later when Washington stopped a British draft resolution in the Security Council calling for a ceasefire in the city and the port of Hodeida. The battle of Hodeida, in the west of the country, where a vital port is responsible for receiving 70% of Yemen's food needs, is the most significant event that would have overthrown the consultations in Sweden in December. Griffith stipulated that the battle of Hodeida should be halted in order to start consultations. This may be the reason for postponing consultations from November to December. In November, the Houthis announced the cessation of ballistic missiles and drones on Saudi Arabia and the United Arab Emirates after Jeremy Hunt’s visit to Riyadh, during which he met with the Saudi Crown Prince. Hunt displayed the proposal of the international community and Britain to stop the war, which angered Prince Mohammed bin Salman, according to CNN ]. The Arab coalition has not stopped its raids on the Houthi positions; Griffith is trying to persuade the coalition to cease air strikes against the Houthis in return for the Houthis' commitment in this regard. The UN envoy is working on building confidence between both sides through steps such as prisoners exchange. He also leads political talks on transitional arrangements amid growing threats to separate the south from the north. Griffith's strategy, which is going on step by step, seems to be reasonable, but the problem is that it will take a long time. In Yemen, there is a catastrophic war with about half of the population facing a possible famine. This means that the time is not appropriate for more quarrels, but the strategy of reconciliation between two victors or not victors indicates that the quarrel is exactly what the Griffith process will produce, partly because any of the warring parties can make consultations a hostage to unreasonable demands. Any attempts to negotiate on a cease-fire can be easily intertwined with the vision of who has the transitional leadership. To achieve the political file before the security and military files means that the next war will require months of negotiations before it can be renewed more violently. For the first time in two years, the delegations of the two sides attended the Sweden consultations, and the consultations began on Thursday, December 6, in a peaceful castle, 60 km from Stockholm. Each delegation consists of 12 people. The delegation of the internationally recognized government is headed by Foreign Minister Khalid al-Yamani. The delegation of the Houthis is headed by Mohammed Abdul Salam, spokesman for the armed Houthi group. On the first day of consultations, the two parties signed an agreement on the release of prisoners and detainees from both sides. The Red Cross said that the number is up to 5000 prisoners and detainees, and that it will participate in the release process. A progress in the file of prisoners and detainees has been achieved, which means that there is progress in the confidence-building measures discussed in the consultations, but that is also linked to progress in other areas. 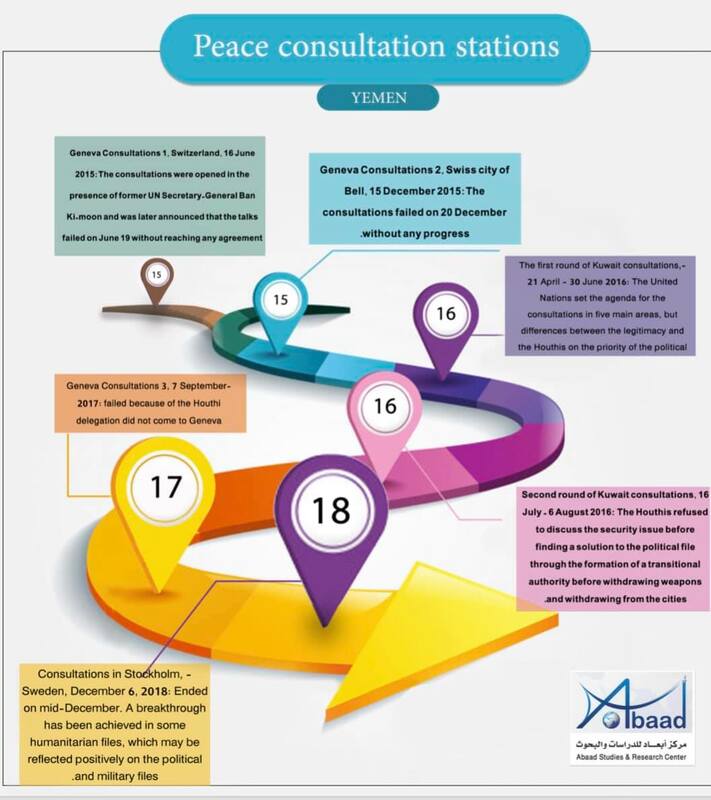 Consultations are not direct as the UN Envoy moves between the two delegations in six main files: the political, security and military file, the file of the port and the city of Hodeida, Sana’a airport file, the file of prisoners and detainees, the file of the unification of the Central Bank and salaries payment, and the truce and cease-fire file. The problem of which one should be first, the security file or the political one, is clear in the consultations and all previous consultations. The legitimate government is adherent to the commitment to the three reference points: "The Gulf Initiative and its Executive Mechanism, the outcomes of the National Dialogue Conference and Security Council resolutions, most notably Resolution 2216." In Geneva consultations in 2015, the Houthis agreed, under UN pressure, to recognize the UN Resolution 2216, which calls on the Houthis to withdraw from the cities and hand over the weapons that they looted from the Yemeni Army stores to the Yemeni government. The Houthis did not recognize the Gulf initiative that brought President AbdRabbo Mansour Hadi to power (2011-2012), although they participated in the National Dialogue Conference (2013-2014) that is part of the mechanism of transition stipulated by the initiative, but at the end they [ the Houthis] turned against its outputs. In the current consultations, the Houthis reject the recognition of the three authorities and want a new Security Council resolution to accommodate the new developments. This means that they will continue to control the cities to ensure that the weapons will remain in their hands and refuse to recognize the need to restore the legitimate authority of the country. This main dilemma comes in the context of a sharp difference that may fail any progress in the remaining files. The Houthis require a new transitional authority that does not include the president: "Hadi is over" - according to a member of their delegation. This transitional authority proposed by the Houthis would have to be between two and three years and that the coming authority should be able to receive arms from all parties, including the government's own weapon or the National Army. The problem of militias operating outside the government and supported by some of the Arab Coalition countries is a justification for the Houthis. The legitimate government's control of the areas under its administration is another justification for the group to impose their vision on the government and the 10 sponsoring countries, whose ambassadors are in the background to pressure the parties in Sweden. But this situation is due to the main reason, the Houthis coup against the legitimate authority in Yemen, the Houthi occupation of the state institutions and the establishment of powers parallel to the authority of the state since 2014. Without solving this dilemma, without the survival of the symbol of legitimacy and elections in the country represented by the election of Hadi as president, the country will enter a new cycle of violence and endless disputes. The Yemeni government puts forward a proposal that the Houthis hand over weapons, withdraw from cities and then the formation of a coalition government including the Houthis, but the Houthis reject this and see that the political and security sides should go together starting with the political aspect of forming a transitional government. Griffith has continued to receive the views of both parties since February 2018 and Ould Cheikh did the same before him to solve this dilemma, but no new ideas have appeared yet for a solution. Without making a breakthrough in this file, talking about the cease-fire seems to be impossible. The city and the port of Hodeidah have been embroiled in a bloody war that is expected to be the most destructive. The fighting ended in early November 2018 due to heavy pressure from the international community on the coalition. The coalition is aware of the risk of a land battle in the streets and alleys of the city. The military operation that was planned for only four weeks may last for several months. No one can expect the degree of the readiness to take over the city in a few weeks and guerrilla in the cities can turn into a long depletion. The Houthis try to focus their efforts to prevent the loss of the port, so they consider it as a fateful battle. Unlike the legitimate government that is supposed to deal with the battle of "Sanaa" and liberating it from the Houthis as a fateful battle through which it can announce a victory against the Houthi group and exercise its authority from the country's original capital. The United Nations is pushing for an agreement on the port of Hodeidah. The Houthis believe that a UN supervision on the port and its imports is acceptable while the government accepts a UN supervision of the port on condition that the port should be run by the same staff before September 2014 and the port’s revenues must be transferred to the Central Bank of Yemen in Aden, but it also sees that the presence of the Houthis in the city is not acceptable. It requests the handover of the city and the rest of the ports to the legitimate government. The United States and the United Nations believe that handing over the port and the city to a neutral party is the safest. However, a road map that was leaked during the consultations suggests that any military escalation must be stopped, the withdrawal of all military units and armed militias from the city and the ports of Hodeidah, Salif and Ras Issa. It also suggests that the security mission should be assigned to the coast guards and installations security and that the administration of the port should be assigned to the staff of the Customs Authority that was employed until 2014. 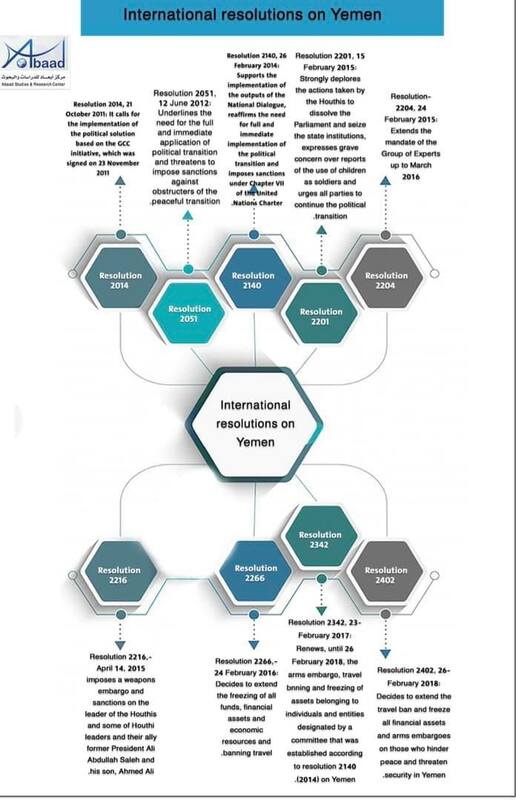 It also suggests the deployment of UN supervisors and the handover of the city affairs to civil servants and former local authority officials to handle the life affairs of the people, and receiving revenues to the branch of the Central Bank in Hodeidah for the purpose of delivering salaries of the state employees. It also calls the Houthis to handover landmine maps in the city and ports of Salif and Ras Issa. Sana'a Airport stopped receiving flights in August 2016, except rare United Nations flights. The Houthis in the Sweden consultations demanded a full reopening of the airport as it was before March 2015. In contrast, the Yemeni government believes that the air embargo on the airport could be lifted on condition that planes must be inspected in Aden and Sayoun airports, and that Sana’a International Airport be turned into an internal airport. The Houthis reject this proposal and adhere to their demand. During the period of March 2015 and August 2016, the planes that take off from and land in Sana’a International Airport used to be inspected at Saudi Bisha Airport. Houthis reject their refusal of the inspection of planes in Aden and Sayoun because they believe that the two airports are not subject to purely Yemeni authorities. This suggests that the Arab Coalition’s policy is away from the overall objective of military intervention in supporting the legitimacy, giving the Houthis a foothold to undermine the legitimacy of the government. The Central Bank of Yemen is unable to cope with the current split and is unable to meet its responsibilities. The Saudi deposit of $ 2 billion has not been placed in the bank's accounts but in the account of the Central Bank of Yemen in the Saudi National Bank. Government employees in the Houthi-controlled areas have not been paid for more than two years; the salaries of the legitimate government areas have been paid periodically; the government says the Houthis do not hand over revenues to the central bank in Aden and they are responsible for the consequences. The United Nations has put the central bank on the agenda of the Sweden consultations to address the bank split in order to pay the salaries of employees, and even find a body that can receive the revenues of the port of Hodeidah and handing them over to the government employees. There are 1.2 million employees who have not received their salaries, another disaster added to the humanitarian disaster. The collapse of the Yemeni currency due to the division of the Central Bank and the speculation, which in part seems to be politically and militarily, requires that the interlocutors find a solution to this crisis. However, the political agreement is linked to all this. This is the most moving file. In addition to being an important humanitarian file, it will also be subject to a political agreement later on. Both parties have made progress in an agreement to "release prisoners and detainees" on both sides "all for all". On December 9, the Houthi delegation handed over lists of prisoners, but the government delegation requested a deadline for names on the front lines. The two sides will make efforts to achieve success in this file, in order to reassure the Yemenis that they have begun to heal and get out of the circle of war to the agreement. For the figures, there are thousands of Houthi fighters in the prisons of the legitimate government and in the Saudi territories, including leaders in the first and second grades. There are also more than 19000 political prisoners in the prisons of the Houthis, who were kidnapped from their homes over their political activity or only because they are loyal to the legitimate government. In this case, the parties will talk about the exhumation of bodies from combat sites and the formation of committees under the auspices of the Red Cross. The current consultations cannot be relied upon to end or stop the war. The consultations will end on December 14 and there will be a new round in January in another country, possibly Kuwait. The two sides may reach an agreement on Sanaa airport, if the Houthis accept the inspection at the other Yemeni airports. Progress in the file of the prisoners and detainees is a common interest of the two parties, but making progress in the issues of the port of Hodeidah and the Central Bank will be difficult. With the commitment of the legitimate government to pay salaries of the government employees in Sana’a and to stop the deterioration of the Yemeni currency, as it happened in November 2018, the Houthis would lose some of their economic power. Regarding the question which one should be first, the political or the security file, it does not seem that the two sides will be able to make a progress. In case the consultations ended without persuading the Houthis of the return of the legitimacy as a transitional authority that includes the Houthis, and of dealing with the security before the political, the Arab Coalition may resume its support to the legitimacy and the fighting against the Houthis to take over the port of Hodeidah, despite the cost and the international pressure to prevent the occurrence of such humanitarian consequences. Hodeidah will remain a 70-kilometer-long depletion front. Actual military action in the Nehm front, east of Sana'a, may begin in the direction of Arhab in the period of December 2018 through January 2019. It seems that this time, the movement of Nehm front will be tribally and militarily motivated, rather than an orientation by the Arab Coalition that may provide logistics and some flights, but it will not be able to prevent this battle. In Nehm, three military regions are preparing to fight the battle of Sana'a with more than 25 brigades and military units, along with special task battalions that have been trained over the past period to fight armed gangs and break into cities. In the battle of Nehm, the third military region is located on the left of the front, while the sixth military region is located on the right and the seventh military region is in the heart of the front. The National Army and the Resistance intend to move to Arhab, northern gate of, in order to cut the supply line of the Houthis in Sana’a. Thus, Sana'a will be besieged on the line from the south in "Serwah" to the east in Nehm up to Arhab, 60kilometer-long clashes line. This means the control of Sana’a airport, even if the western side of the capital is left as an outlet for the Houthis. By controlling the airport, the end of war can be declared and the Houthi rebels will be defeated and the coup will be practically dismantled on the ground. The United Nations, Western sponsors, the Houthi group and the legitimate government can talk about ambitions for consultations, but talking about hope of stopping the war seems to be impossible. The peace process in the country is still long and difficult, and many parties that did not exist in March 2015 have already engaged in the conflict. The interlocutors in Sweden have no choice other than reaching an agreement that stops the war and reinstates the state institutions and makes the weapon exclusive to the army, which will be formed under local, regional and international supervision so as to be the nucleus of the legitimate army of the legitimate president. Without this, the country will remain in cycles of renewed violence even if a formal agreement was reached under a foreign pressure. The restoration of the state institutions and the building of institutions that have been demolished is the guarantee of the return of a secure and stable homeland with a republican according to the outputs of the National Dialogue Conference, within a short transitional phase that guarantees voting on the draft constitution and electing representative institutions expressing the people. A long transitional period means more differences over quotas. Unless the agreement happened or one party made a victory against the other, we are to witness a long war and chaos, which will quickly penetrates the wall of the regional security and threaten the security of the Gulf States in particular and put the corridors of the international trade at the heart of that chaos.